As I moved into my first real home and out of my Mom's comforting arms, I made it my mission to take as little stuff as possible into our apartment. Less is more, and all that. We're now a year in and I've somehow gathered more stuff that I don't need again. Time to declutter: Minimalism 2.0. I'm going to give myself until the end of November to declutter four spaces in my life (let's be honest, ain't nobody got time to do this in a month's time): my closet, my beauty products, our kitchen and my laptop/phone. You're probably asking yourself: why though? Well, firstly, we won't be living here forever, and when we move again, I want it to go smoothly and not hauling stuff that I don't need/want with me. Secondly, when we start thinking about adding a little human into the mix, I know he or she will be taking a lot of space, and I want to be comfortable with what we have before doing so. Also, I just love decluttering and that kind of stuff.What I'll be doing is taking out every item in each category and then deciding on what to keep, throw, or donate. Sounds basic, but when in doubt, I'll just be asking myself if I used it the past year or not. And if I haven't, than maybe I don't need it, right? The stuff that is occasional like skiing clothes or specific baking items I'll be putting in boxes, so they don't bother me on the daily. I hope that our lives will be a little less cluttered and a little more breathable.I think I'll be calling this my Minimalism 2.0 series, so you can follow the posts that way. I'm excited to see which problems I'll stumble upon and what the end result will be. Do you have any tips? 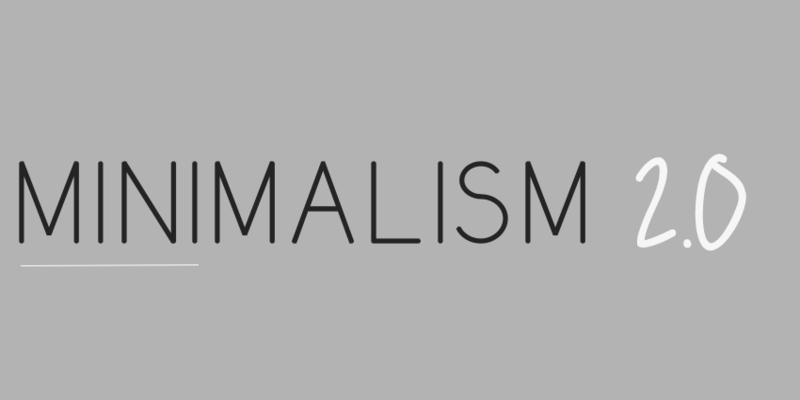 What are your thoughts on minimalism?